Today all Americans and most life-forms on Planet Earth are living inside the Book of Exodus — our health and livelihoods, our freedom and our lives, endangered by modern Pharaohs who are oppressing human beings and bringing Plagues upon the Earth. Indeed, our Pharaoh-in-Chief is uncannily following the ancient Pharaoh’s road-map through arrogance and cruelty and subjugation into – the Red Sea. One vigorous response: Like the ancient Israelites and their allies, let us turn the Passover Seder from a commemoration of the past into an “insightment,” an incitement to nonviolent transformation of the future. In 1969, in the midst of a crisis over racism and war, Jews joined with Black and white Christians to create a new kind of Seder. We called it the Freedom Seder. 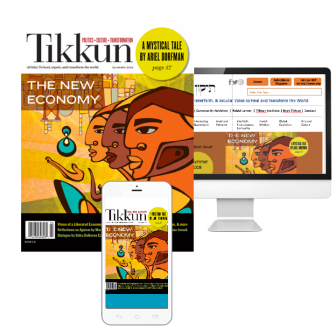 For the first time in 3,000 years of Jewish history, it wove together the liberation struggles of other peoples – especially Black America – with the ancient freedom struggle against Pharaoh. We held it on April 4, the first anniversary of the murder of Dr. Martin Luther King. 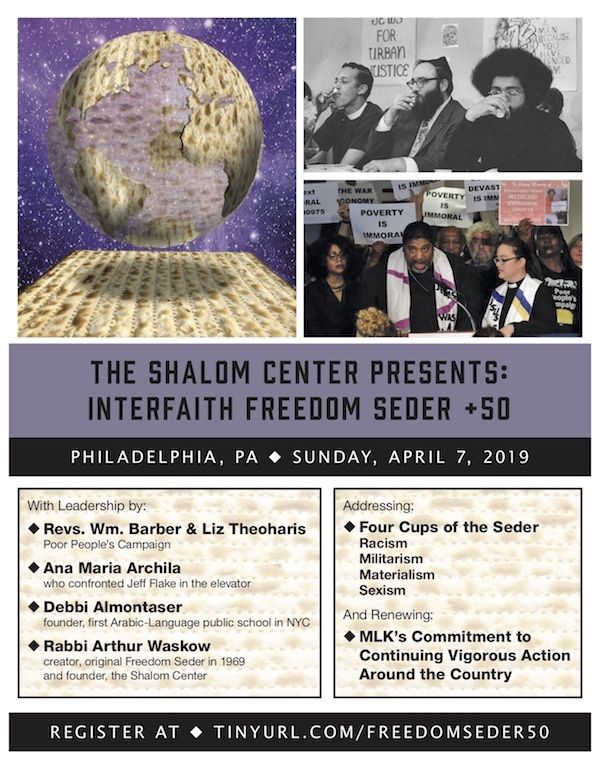 This coming April 7, fifty years later, in the midst of an American and a planetary crisis even sharper, The Shalom Center is sponsoring a new Interfaith Freedom Seder + 50. We are doing this not to commemorate the past but to transform the future. Among its leaders will be Reverends Willam Barber and Liz Theoharis, co-chairs of the Poor People’s Campaign; Ana Maria Archila, who challenged Senator Flake in the famous US Capitol elevator and who heads the Center for Popular Democracy; and Debbie Almontaser, who has both suffered from anti-Arab hatred, and transcended it. These national Resistance leaders will be joined by grass-roots front-line survivors of the Plagues that our modern Pharaohs are bringing on the world – gun violence, families torn apart, racist pressure on under-funded, stressed-out schools that then can deliver only substandard education, asthma epidemics brought on by the same oil refineries that are burning the world, the murders at Tree of Life synagogue in Pittsburgh, violence against women and gays. If you live in or near Philadelphia, please join us in eating together, singing together, learning together, taking action together. You can register to come for Dinner and the Seder or for just the Seder. Click to TINYURL.COM/FREEDOMSEDER50. (1) Prices go up on March 23rd! (2) Pre-registrations end April 5th! (3) Everyone must pre-register: No walk-ins or live-streams without pre-registration! Join us for a spectacular and transformative evening! Rabbi Arthur Waskow founded (1983) and directs The Shalom Center, a prophetic voice in Jewish, multi-religious, and American life for eco-social justice, peace, and healing of the wounded Earth.